(NaturalNews) Consumers are becoming more aware of the chemical mass production of commercial body care products that are loaded with synthetic ingredients. Possibly a symptom of an economy looking to cut costs, body care products like soap and deodorant have moved away from being "personal care" products to being personally destructive, cancer-causing silent killers. From containing hormone disrupting phthalates and poisonous triclosan, to harboring heavy metals and toxic surfactants, many mass-produced body care products have become utterly dangerous. As consumers become more aware, many people are now switching to all natural, organic products. 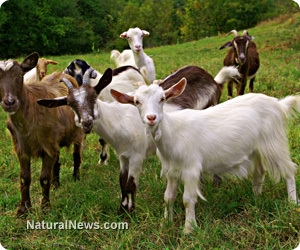 One natural body care product that's gaining attention is goat's milk soap. Here are the five wonderful benefits of using goat's milk soap versus commercial sodium lauryl sulfate blends.